The recently renamed Adolfo Suarez Madrid-Barajas Airport (MAD) is the largest airport in Spain and one of the busiest in Europe. Serving the country's capital city, it is located only a short journey away from the city centre and a quick train ride from the southwest of Spain. We've put together this handy guide to bring you all the information you'll need to make your journey to Madrid airport as easy as possible. The airport is located just 13 km outside of the city centre and has four terminals for arrivals and departures, T1, T2, T3 and the newly introduced T4. The airport has more than 20 information counters including touchscreen kiosks in Terminal 4. MAD airport runs a 24 hour shuttle bus that runs between terminals and the long-stay car park. This service is completely free and buses come and go every 5-10 minutes. In addition to this, T4 is accessible via a monorail that links to the airport's main building. 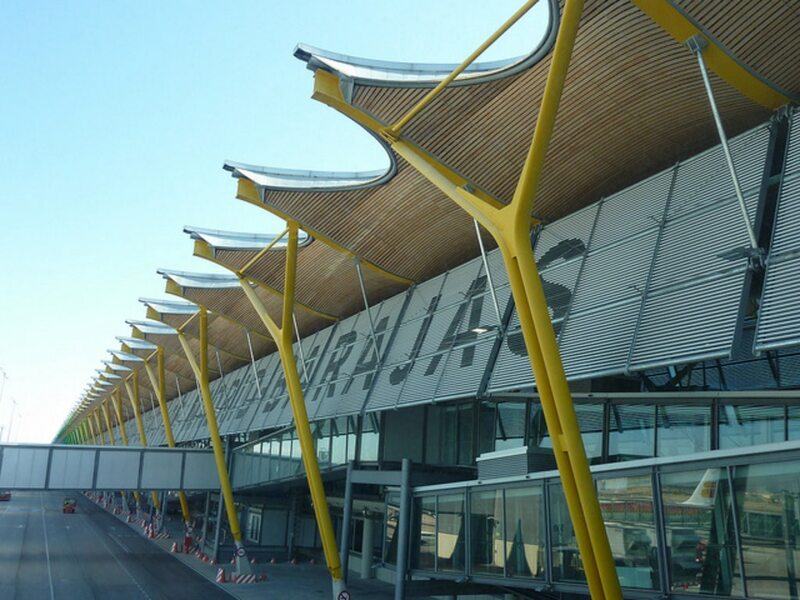 There are numerous public transport and private hire options for travelling to and from Madrid Airport. Check out the information below for your preferred method of travel. Taxis are a comfortable option from the airport: the journey only lasts approximately 20 minutes and costs about €20-25. Taxis are available from each terminal and can be found outside the arrivals area. Passengers should make sure the meter is turned on at the beginning of the journey and are advised not to accept any other offers of taxis inside the terminal building - official taxis are white in colour with a red stripe. AeroCity-Ares Mobile (tel: 91 7477 570) provides chauffeur-driven cars. Buses run regularly between the airport and central Madrid. Bus 200 will take you to Avenida de America station in the city centre in about 30 minutes for a small fare of €1.50. If heading to Atocha station, take the Linea Expres 203 - journey time is estimated at 40 minutes and costs €5. 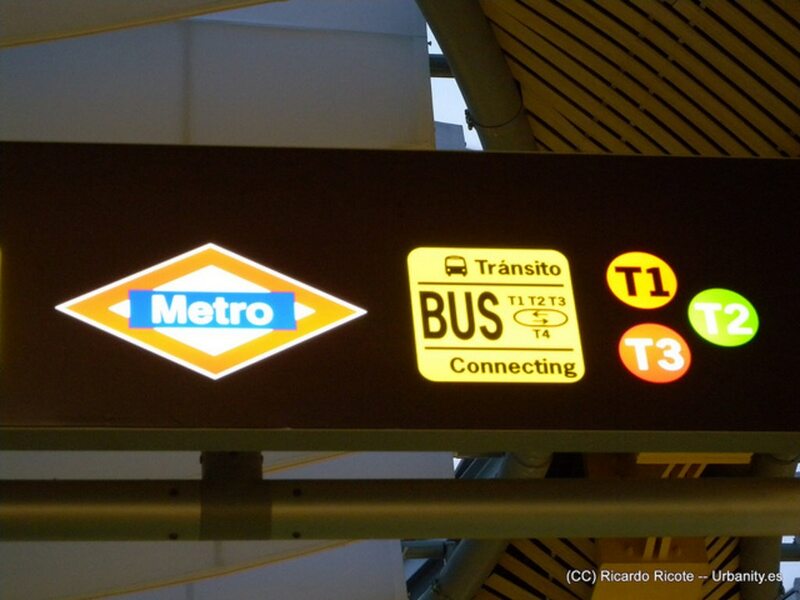 The metro is probably the quickest and easiest way to travel from the airport to Madrid city centre. Line 8 will take you to Nuevos Ministerios which is located right in the heart of Madrid's financial district. The journey time is only 15 minutes and costs €4.50. You can jump on the train from underground stations at T2 and T4. The airport operates a RENFE train station situated at T4. The line operates along the C1 route which runs between the airport and Principe Pio station. If heading to Principe Pio expect about 40 minutes for the journey and a fare of €2.55. The service also stops at Atocha and Chamartin stations. Madrid-Barajas airport has many bureaux de change and ATM's throughout the airport and two banks in T2 and T4. Each guest gets 15 minutes free Wi-Fi which is available in all terminals. If you run out, there are numerous internet points throughout the airport. With over 30 cafes, bars and restaurants across the airport there are plenty of options whether you fancy grabbing a quick snack or an elegant sit-down meal. 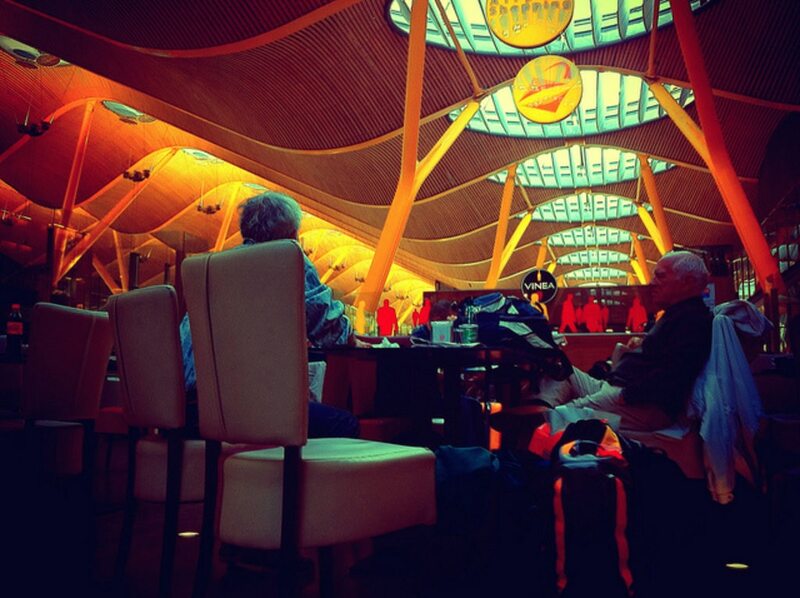 Madrid Barajas airport has over 100 shops that you can take a stroll through whilst waiting to board your flight. Duty-free is also available for anyone flying outwith the European Union. Car hire companies are situated in T1 and T2 - these include Avis, Europcar, Hertz and Sixt. Long and short stay car parking facilities are available within six public parking areas at Madrid airport. A free shuttle service runs between the long stay car park and the airport terminals. Once you've completed your journey, why not take a look at some of the fabulous eateries and elegant bars around the city to refuel? Images by Chris, Daniel and Ricardo, used under the Creative Commons Licence. *All prices are as of December 2014 and approximate only. Located on central Madrid's main artery, the Gran Via, opposite Plaza Callao, this historical building reflects early 20th-century eclectic style with ornate stucco work topped by a French cupola. Located in Gran Via, this hotel is within a 10-minute walk of Casino de Madrid, Plaza Mayor, and Thyssen-Bornemisza Museum. Prado Museum and El Retiro Park are also within 1 mi (2 km). Located in Barajas, this luxury hotel is 2.7 mi (4.4 km) from Madrid Congress Centre and within 6 mi (10 km) of Real Madrid City and Aquopolis. Las Ventas and Thyssen-Bornemisza Museum are also within 9 mi (15 km). Book a stay in any room and rate category and receive free shuttle service to IFEMA Trade Fairs during conventions (subject to availability and upon request) and free shuttle service to the city center (upon request). Full details at check-in. Offer subject to availability. Restrictions may apply. Located in the city center, this Madrid hotel is close to the Puerta del Sol and the Gran Via. The Plaza Mayor and Museo del Prado are also nearby. This family-friendly Madrid hotel is located in the historical district, just steps from CaixaForum Madrid and Museo Nacional Centro de Arte Reina Sofia. Prado Museum and Thyssen-Bornemisza Museum are also within 15 minutes. This Madrid hotel is on Gran Via, lined with shops, theaters, and architectural treasures. Plaza de España is within a 5-minute walk. Plaza Mayor and the Royal Palace are 0.7 km (0.5 mi) away. Offering a prime location a 5-minute walk from Puerta del Sol and a block from the metro, this modern hotel is within 1 km of Plaza Mayor, Museo Thyssen-Bornemisza, and Museo del Prado. Parque Retiro is 2 km away. Right in the heart of Madrid, this hotel is close to dining, nightlife, art, culture, shopping, museums (Prado, Thyssen-Bornemisza, and Reina Sofía), and next to the commercial and business area as well as tourist attractions, such as Retiro Park, Puerta del Sol, Royal Palace. With its convenient location on the Gran Via near 3 metro lines, TRYP Madrid Cibeles Hotel is a convenient starting point to visit the Prado or Queen Sofía museums. Guests will be a 10-minute walk from iconic Plaza Mayor, and 15 minutes from the Royal Palace. Modern 3*** design hotel located in the area of the Barajas airport and Ifema exhibition centre. Large rooms fully equipped. Its situation next to Barajas airport and very close to Ifema turns it into the ideal place for business trips and connecting stays. We also have a great offer for the celebrations of different events, for companies or private ones. Grand hotel on Madrid's famous central thoroughfare of Gran Via, less than 1 kilometer from Plaza Mayor, Royal Palace, and Puerta del Sol, and 2 kilometers from the Prado art gallery, and Retiro Park. Strategically located next to Barajas Airport and the IFEMA Exhibition Center, The Axor Barajas Hotel was born with a clear vocation of service and personalized attention, supported by an elegant and modern design. It has 217 rooms equipped with the latest developments, a wide range of services to hold your events, both private and business, and a vanguard cuisine in its restaurant. Design, personalized attention and respect for the environment shapes the philosophy of Axor Barajas Hotel. Meliá Madrid Princesa is a 5-minute walk from Plaza de España and 15 minutes from the Royal Palace and the historic arcades of Plaza Mayor. Ventura Rodríguez Metro Station is steps from the lobby, connecting guests to the rest of the city. Located in Golden Triangle of Art, this luxury hotel is within a 10-minute walk of Thyssen-Bornemisza Museum and Prado Museum. Plaza Mayor and El Retiro Park are also within 15 minutes. Located in the cultural heart of vibrant downtown Madrid, this opulent 5-star hotel set in a former palace is a 6-minute walk from Palacio Real de Madrid. The upscale boutiques of Gran Via are 8 minutes away on foot. Explore the must-see sights of the Spanish capital as you pedal your way through narrow alleyways, along bustling plazas, and outside of historical buildings.